Soft water without salt? Many of us want soft water, it has many benefits including extending the lifetime of our plumbing fixtures. Who wants to add salt to their water and carry heavy bags of salt to their system? We have partnered with a company that has a solution, softening with citrus. Simple maintenance that takes 60 seconds twice a year and doesn’t add sodium to your water. 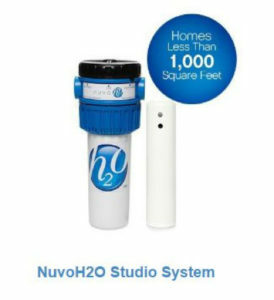 Nuvo H2O has a solution for your home, the Nuvo Studio system is for homes that are less than 1,000 square feet. This system is great for mobile homes, RV’s and Toy-Hauler’s. Studio system for homes with up to 2 people, 1 or 2 bathrooms, or up to 1000 sq ft with a water main of 3/4″ to 1″. The nuvoH2O doesn’t waste any water, doesn’t require electricity and only contains recycle-friendly components, making it healthier for you, your family and the environment. You’ll never buy salt again. Just change the patented cartridge it takes 60 seconds and lasts 6 months. The nuvoH2O Studio system uses revolutionary technology to lower the PH level of water based on the basic scientific process of chelation in which the metal ions causing hard water, principally calcium and magnesium, are bound to the chelating agent in nuvoH2O’s FDA-approved, proprietary formulation, which keeps the minerals soluble and unable to cause hard water problems. The resulting water is soft and healthy for all of your household uses, including drinking, bathing, washing, and lawn and plant watering. If the Nuvo Studio System sounds like something you may be interested in, contact the professional plumbers at Robins Plumbing, Inc today. We understand the unique challenges of the Phoenix water system, and our plumbing company can help you find the best system for your home or commercial business. The Nuvo Studio System, Nuvo Home System, Nuvo Manor System, and NuvoH20 Complete System are all great water treatment options. We also offer residential plumbing and commercial plumbing services, including drain cleaning, water heater repair and replacement, faucet repair and faucet replacement, and much more. Schedule your free estimate by contacting our Phoenix plumbing company today.